Marion, Iowa Oct. 16 Hostess -- Mrs Shumack. Meeting called to order by the Pres. Roll call responded to by favorite quotations. Minutes of Oct. 2nd read and approved. A balot was taken which resulted in the election of Mrs. Owen Fernow as a new member of our club. 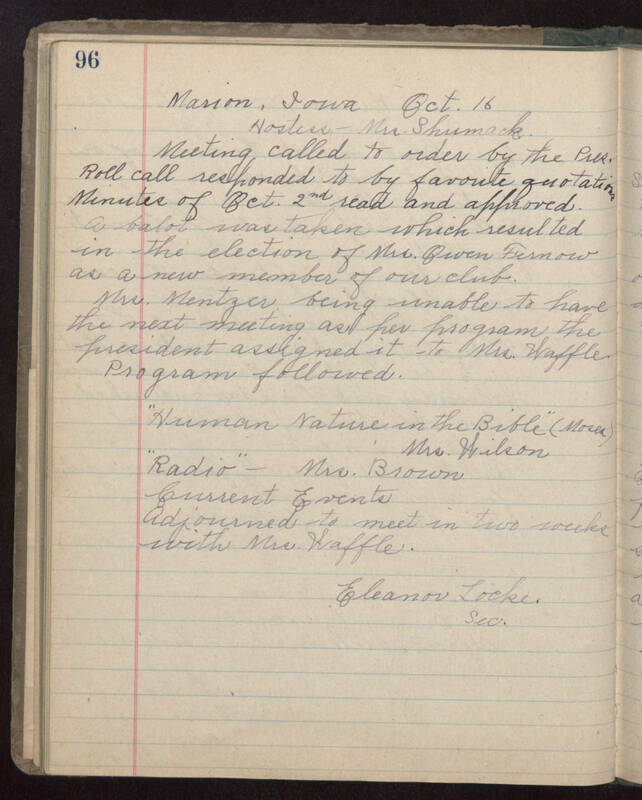 Mrs. Mentzer being unable to have the next meeting as her program the president assigned it to Mrs. Waffle Program followed. "Human Nature in the Bible" (Moses) Mrs. Wilson "Radio" -- Mrs. Brown Current Events Adjourned to meet in two weeks with Mrs Waffle. Eleanor Locke. sec.